I used to be a hair stylist so I still have my cosmetology license. 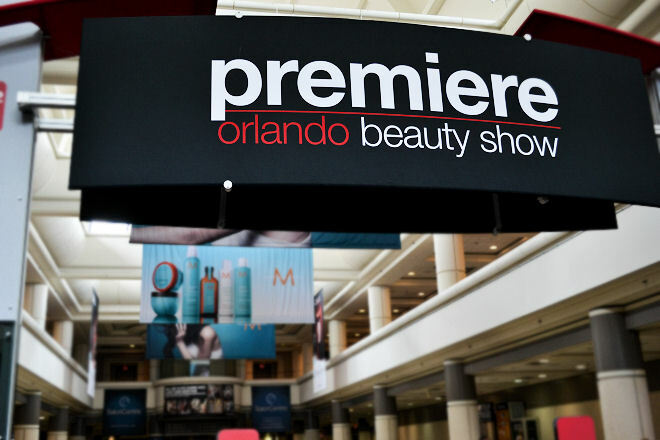 Every year, to get a little dose of an industry I still love, I attend the Premiere Orlando international beauty show. 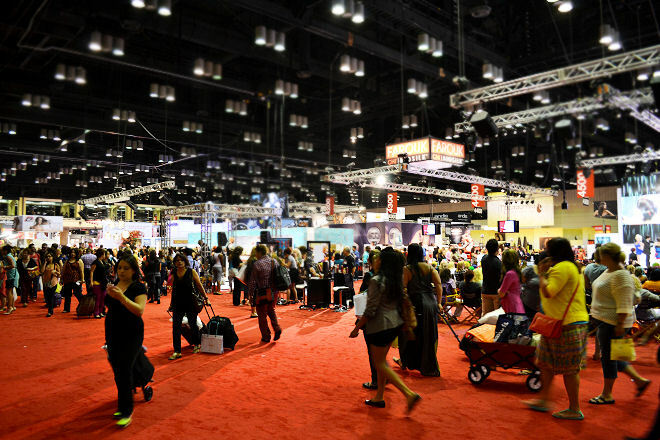 All of the best brands in the industry set up a booth, showcase their new and favorite products, give you samples, bags, and even some offer complimentary services. 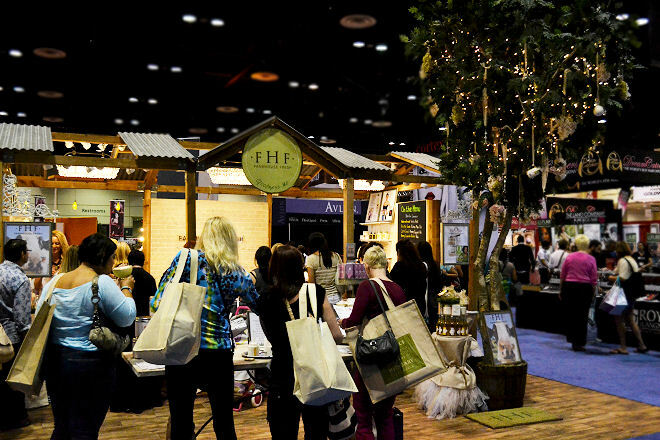 One of my favorite things to do at this show is check out the different booths and how each one attracts guests - that's the event planner in me. This booth above did a whole farm house theme and even brought in a tree and hung ornaments from it. Definitely caught my eye from across the floor. 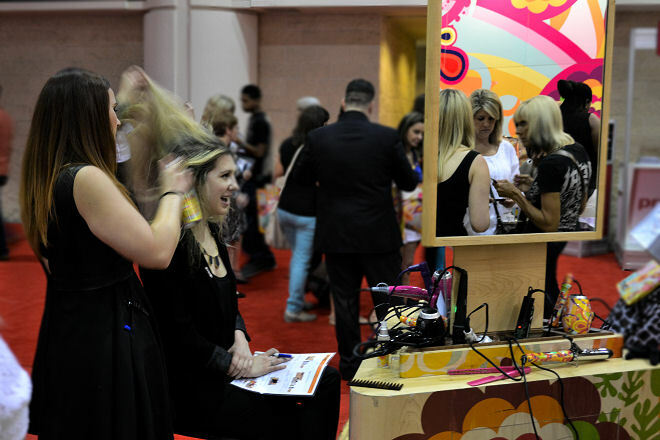 Another thing I love to do at this show is sit at each booth with a stage and watch their hair shows. This is where I've seen big names like Tabatha and Sam Villa. Sam Villa actually stayed on stage styling, cutting, coloring almost all day while I was there. That's hard work. They walk hair stylists through every cut, every angle, every product they are using and are constantly suggesting tips. We started at the skincare section, made our way to the hair care section, then the nails, and I spent my last hour in the hair section. I purchased Moroccanoil, a new flat iron, OPI nail polish, and I got my shears sharpened. The few things that I forgot/couldn't find in the immense jungle were Hemp moisturizer, Nioxin shampoo, and It's A Ten hair product. Just a few of my absolute favorite brands. Stylists from each brand are on-site to do complimentary styling. I didn't get anything done, I was there to shop and learn. I sat down at one stage for 5 minutes and learned 3 new techniques. This is an industry that is always evolving and changing. I think that was one of the things that drew me to it (besides the immensely creative people and freedom). 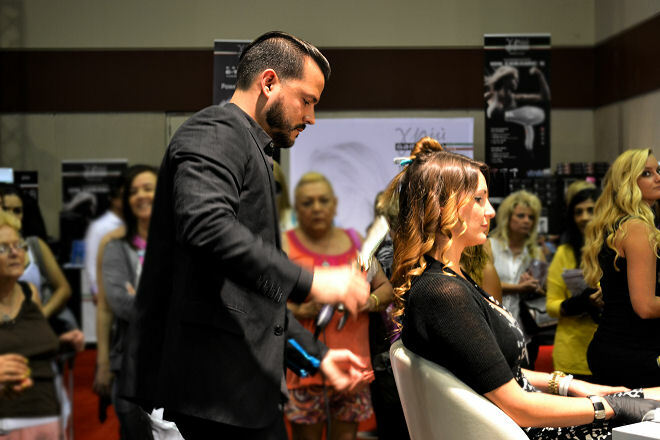 There is alway new products that are innovative and many continuing education opportunities to take advantage of. 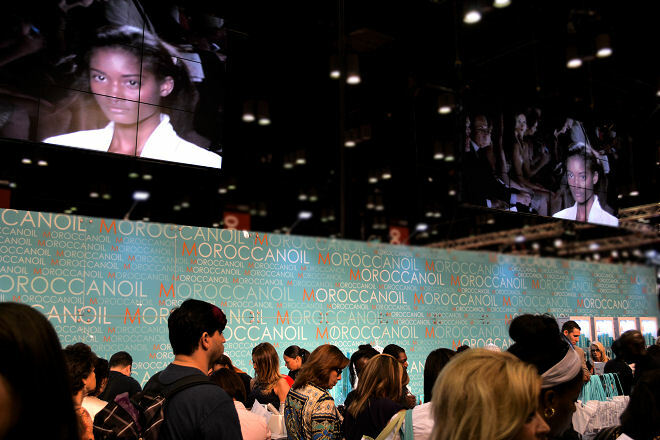 My favorite booth to visit every year is the Moroccanoil booth. Despite the long lines, it is always worth it to stock up on my favorite Moroccanoil products. The traditional oil is my hair's best friend. 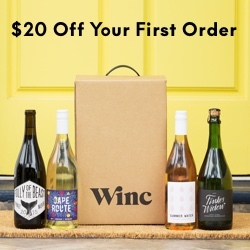 I've gotten almost everyone in my office to use it - it's a dream product! It's the most healing of all oils and leaves hair feeling silky and shiny without being heavy or oily. Their hair spray is also awesome and their shampoo and conditioner is so silky and smells like the prettiest perfume. Most of the brands give away reusable bags with samples in them, or they give you their reusable bag when you buy a product. One of my favorite things is seeing all the different bags that come out every year because it is such genius marketing. You see one person with it and you suddenly remember that you have to visit that booth. Moroccanoil changes their bag design every year so I have three bags that are all different and I love them all! They are the best for packing my toiletries when traveling, and toting magazines to the pool. There is a brand called Eminence and every year they give away these gigantic canvas bag (you can see them in the second photo). 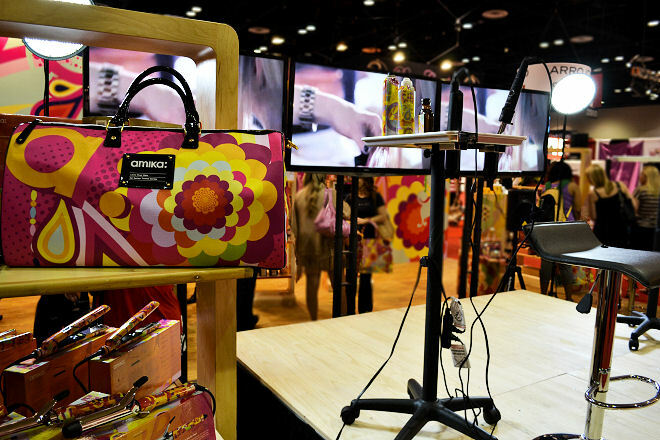 Every year, I look forward to picking up one of their bags because it is just the perfect beach bag and when shopping for product at the hair show, I can fit all of my other bags inside of it! I adore that I have this event right in my city. 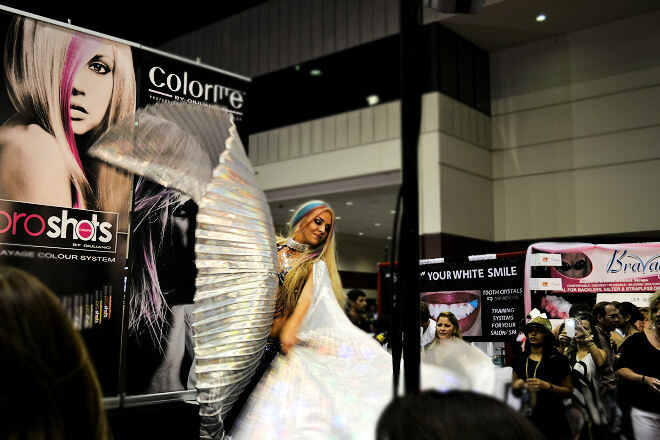 It's such a crucial event to the hair industry and I love going every year. One day, it would be so cool to work on it as an event planner. In the meantime, I will keep attending the show because I won't live here forever and won't always have the opportunity to go. How funny is this! My mom was there too!!!! She's a hairdresser for JCP and went to this. She brought me home bucket loads of samples and a really nifty bag that I might use for a diaper bag... HAHA!!! I was looking in your photos if she was in them. DERN! This event sounds great!! 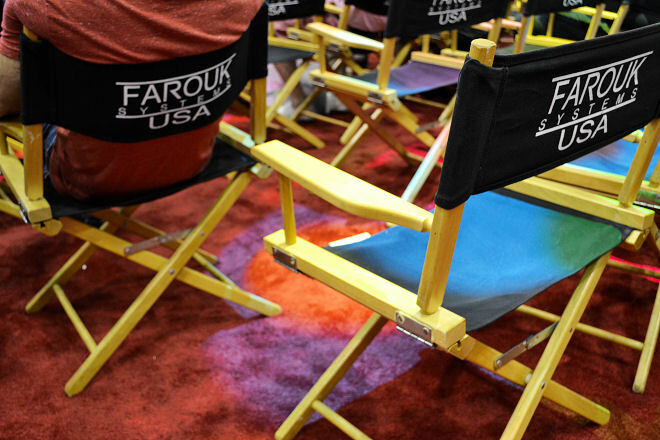 It's wonderful that you go every year and learn new tricks and get new products! Looks like fun! that looks like so much fun. 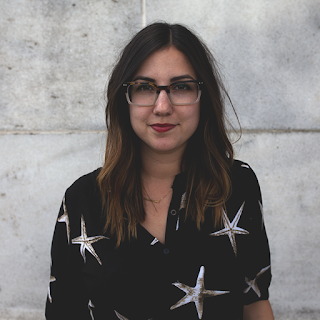 i learned from a friend of mine that used to be a stylist a lot about the hair industry. 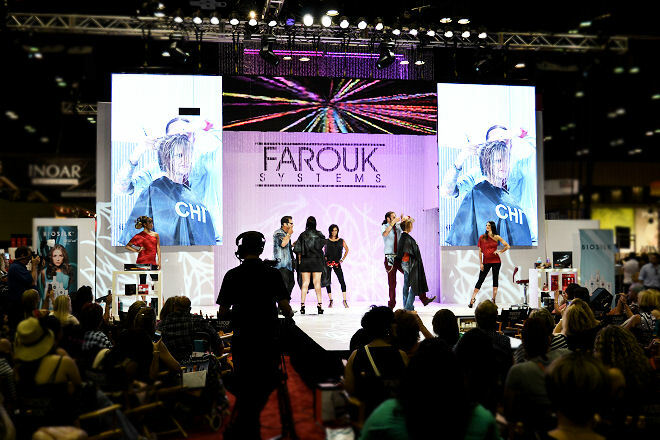 hair cuts can seem expensive but the time and money that stylists put into continued education, quality sheers and all of that is enormous. she once bought a pair of sheers for $1,200! but seriously they made such a huge difference. and i really wish moroccanoil would make a perfume in that scent. it is one of my all-time favorites! light and rich at the same time. love it. Oh wowzie that beauty show looked wonderful. It is nice when people take so much pride in their work.